As commercial businesses become aware of their direct effect on the environment, an increasingly popular building management response has been the adoption of vegetative roofing. 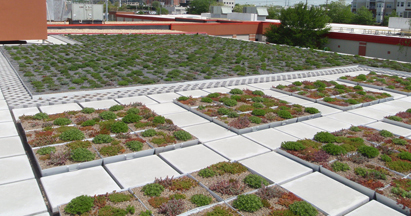 Exchanging traditional roofing systems with vegetated materials, vegetative roofs provide building owners and tenants with numerous ecological, technical and economic benefits. Virtually any flat or gently sloped roof can be transformed into a landscaped environment. Both functional and aesthetically appealing, Vegetative roofs (also referred to as roof gardens) improve the structure's energy efficiency while adding plant life in populated areas. A vegetative roof is partially or completely covered with vegetation and soil or a growing medium over a waterproofing membrane. Some systems also have drainage and irrigation systems. Depending on the budget, irrigation systems vary in functionality and cost. The US Green Building Council has endorsed vegetative roofs through the LEED (Leadership in Energy Efficient Design) certification program. Costs less to maintain because the support, waterproof and insulation layers protect the roof membrane. Lightweight and designed to maximize performance and environmental benefits, extensive vegetative roofs feature a layer of growing medium typically 3-4 inches deep, weighing from 15-30 lbs per square foot. Optimal for ecological benefits, extensive vegetative roofs are not intended for foot traffic. Semi-intensive vegetative roofs can vary from 4-8 inches of media, supporting wildflowers and drought-tolerant, herbaceous perennials. Intensive vegetative roofs provide a beautiful usable space for tenants. Intensive vegetative roofs commonly weigh 30-150 lbs per square foot or more, vary from 8 to 12 inches or more of media, support a wider variety of plants, and have greater needs for irrigation and maintenance. Intensive vegetative roofs require a stronger load capacity given that larger vegetative growth requires deeper rooting and heavier moisture saturation. Intensive vegetative roofing also requires a commitment to investment in regular maintenance.